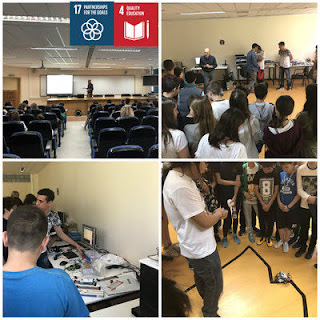 Agenda 2030: "That's our challenge"
A very interesting educational visit was carried out by the teachers and students of our school in one of the best assessed university departments of our country, the Department of Computer Science and Engineering at the University of Ioannina. There we had the opportunity to meet members of the scientific staff, to get informed of the robotics programs they are working on and to see the robots they use in the workplace where they produce their project. The main focus was on a scientific approach that demonstrated the application of Artificial Intelligence towards us. 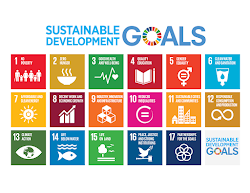 So, we successfully served Goal 4: Quality Education and Goal 17: Partnerships for the Goals, since we got to know innovative technological methods and applications. 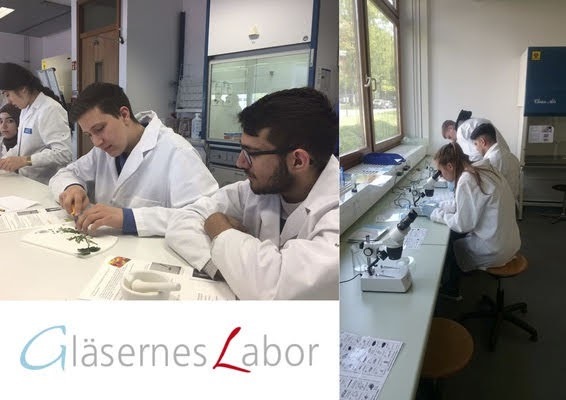 On the 5th of March, 2018 we went to the ‘Campus Berlin Buch’ as part of our biology class and conducted experiments on photosynthesis. Our class was divided into two groups who conducted different experiments. Every student received and examined differing cross-sections of leaves. We found out about the adaptations of leaves to differing abiotic factors. In other experiments we examined how to increase the rate of photosynthesis. For this we manipulated the light, temperature and concentration of carbon dioxide and measured the production of oxygen. In the last experiment we extracted and separated the pigments of leaves with the help of thin-layer chromatography. It became clear that green leaves have got many pigments, not only green, but also yellow and even orange pigments. As a question for furthers studies we asked what function the different pigments have in the process of photosynthesis. The experiments in a real laboratory were a lot of fun. Especially using professional pipettes was interesting because you can measure the tiniest amounts of liquids with it. In June we will visit the laboratory again, but then the topic will be ‘Blood and Drugs’. 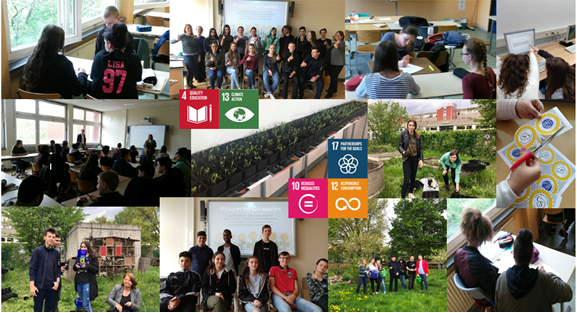 The topics to be discussed in the ecoaudit, by the students from Italy, Greece, Germany and Spain are: consumption and social responsibility, electricity, mobility, noise, water and recycling. 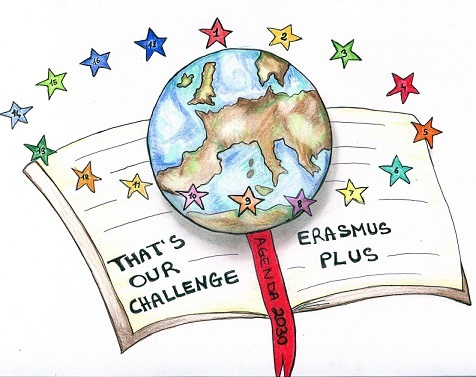 First, the whole group of students taking part in Erasmus+ gathered during the break time and designed a series of question about the different themes above mentioned. 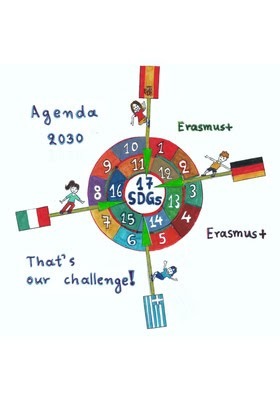 The next step took place in class; in work groups, we selected the questions, translated them into English and uploaded them to the eTwinning forum. Each center uploaded their questions and we arranged a poll to select five questions about each topic. 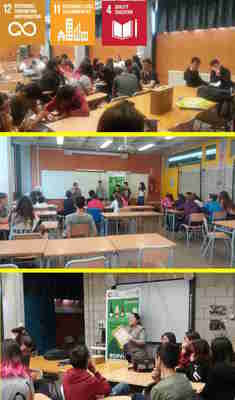 Once the issues were selected, we designed some surveys to be passed on to the students in groups of 4th ESO so that we could study the results statistics. Next, we will carry a study of the data, a comparison with the other centers answers and we will reach our conclusions. The Erasmus+ “Agenda 2030: That's Our Challenge!” team organized a competition in our school unit for the creation of a logo, in order to disseminate the knowledge on the 17 Global Goals of Sustainable Development. The pupils activated their knowledge and imagination and created imaginative works. Then, their projects were evaluated by a committee consisting of representatives of the 15-member student council, as well as the student of the School of Fine Arts of the University of Ioannina, who does her practical training at our school. Among many works, the three students who created the best logos got a prize, during a prize awarding action. 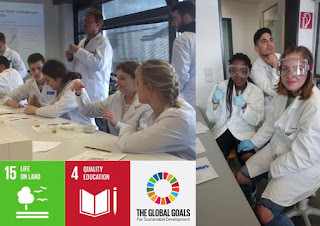 The whole procedure served Goal 4: Quality Education and Goal 17: Partnerships for the Goals, since it involved a number of students that practically proved their interest for our project. Albert Einstein once said that humans “would not survive the honeybees’ disappearance for more than five years”. And we all know, in the past decade, bees have been disappearing at an alarming rate. Therefore, we wanted to take a practical approach and get involved in beekeeping. 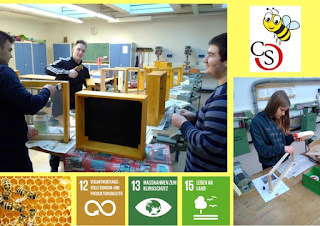 Since last summer two of our colleagues are guiding a group of students to keep bees and produce honey. Thanks to the Erasmus project, EU fonds could be used to purchase material for four bee colonies. In the beekeeping course they learn about the life-cycle of bees, their behaviors and why we should protect them. What is really important for us, is that the students understand why bees are such an essential part of our environment (A third of our fruits and vegetables are pollinated by bees. Almonds are exclusively pollinated by bees). In order to facilitate a closer nature experience and enable the students to comprehend the ecological system, we work with the Pestalozzi teaching principle of „Learning with your head, heart and hand“. More and more teachers and students got interested in the beekeeping and so we soon want to cooperate with the arts classes. As part of our Erasmus + project “Agenda 2030: that’s our challenge!”, grade 9h students have participated in Recycling Workshops thanks to Ecoembes. Ecoembes is the organization that cares for the environment through recycling and the eco-design of packaging in Spain. They make it possible for plastic packaging, cans and cartons (yellow container) and for paper and cardboard packaging (blue container) to have a second life. Our partner organization, called „Proyecto Padrinos de Atiquizaya e. V.“ , helps children in El Salvador. They collect money to pay scholarships for pupils who otherwise would not be able to visit school, since they have to work on coffee, banana or bean plantations. To support the project, the Carlo-Schmid-Oberschule organized a donation campaign. We, the pupils of the Spanish classes of the 7th and 8th grade, are collecting donations to improve the living conditions and educational opportunities of the Salvadoran pupils. Therefore, we plant sunflowers, decorate the flowerpots and sell the flowers for 3,00€ each. You would make us and the Salvadoran pupils very happy if you help us with your donation. 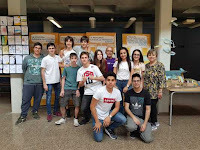 Nosotros, los alumnos de la Carlo-Schmid-Oberschule, estamos colaborando en el proyecto „Proyecto Padrinos de Atiquizaya e. V.“ para ayudar a los alumnos de El Salvador. Queremos conseguir dinero para que muchos niños puedan ir a la escuela y consigan un buen trabajo en el futuro. En El Salvador hay guerra y pobreza. Muchos niños no pueden ir a la escuela, ya que sus familias no tienen tanto dinero como para pagar los gastos escolares. Los alumnos del 7. y 8. grado están participando en este proyecto. Los del 7. grado se encargan de decorar las macetas de papel pintándolas y los del 8. grado se encargan plantar los girasoles e informarse más sobre girasoles y del país El Salvador en general. Lo que haremos será poner girasoles en las macetas decoradas y así venderlas por un precio aceptable (3,00 €). El dinero que ganemos lo donaremos al „Proyecto Padrinos de Atiquizaya e. V.“. Wir, die SchülerInnen der 8. Klassen der Carlo-Schmid-Oberschule in Berlin Spandau, möchten mit unserem Partnerprojekt „Proyecto Padrinos de Atiquizaya e. V.“ den Kindern in El Salvador mit den Spenden helfen. Wir verkaufen Sonnenblumen für eine Spende von jeweils 3,00€ und geben den gewonnenen Betrag an unsere Partnerschule weiter, um einigen Kindern eine ordentliche Schulausbildung zu ermöglichen. Unserer Schule ist es leider noch nicht gelungen unsere Partnerschule zu besuchen, da in El Salvador Krieg und Armut herrschen, dennoch wurden wir bereits schon mehrmals von SchülerInnen unserer Partnerschule besucht. Da viele Eltern in El Salvador das nötige Schulgeld nicht aufbringen können, müssen manche Kinder ihren Eltern auf deren Feldern behilflich sein. Wir sind dafür, dass auch dort die Kinder das Recht auf eine Schulausbildung haben und möchten die Spenden verwenden, um Schulmaterialien zu kaufen oder Schulgelder zu bezahlen. Über Ihre Spende und Mithilfe würden wir uns sehr freuen. Vielen Dank! 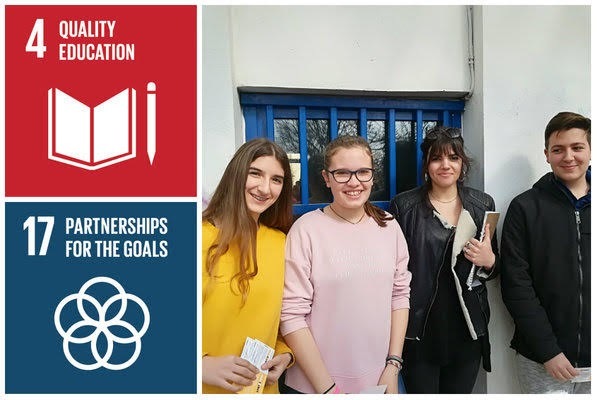 The Erasmus+ “Agenda 2030: That's our Challenge!” team invited the students of our school to participate in the Student Action Week "Planet 2030" of Action Aid. 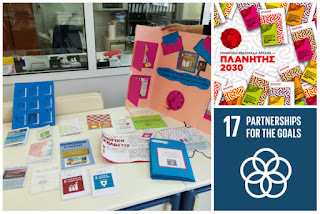 In order to disseminate knowledge and awareness about the 17 Global Goals, students worked to create fanzines based on the digital material of the organization. Thus, they seeked to communicate their ideas to the world and express themselves through their personal publication. The fanzines that have been created will be presented at an Action Aid event in April, which will be included in the plan “Athens: World Book Capital 2018”. This action is considered as our Best Crowd Engagement Action, since it involves a great number of participating people, who get informed about the Agenda 2030 and our initiatives to serve it not only in our city limits but on our country level as well. The content of this blog does not reflect the official opinion of the European Union. Responsibility for the information and views expressed in the blog lies entirely with the authors.